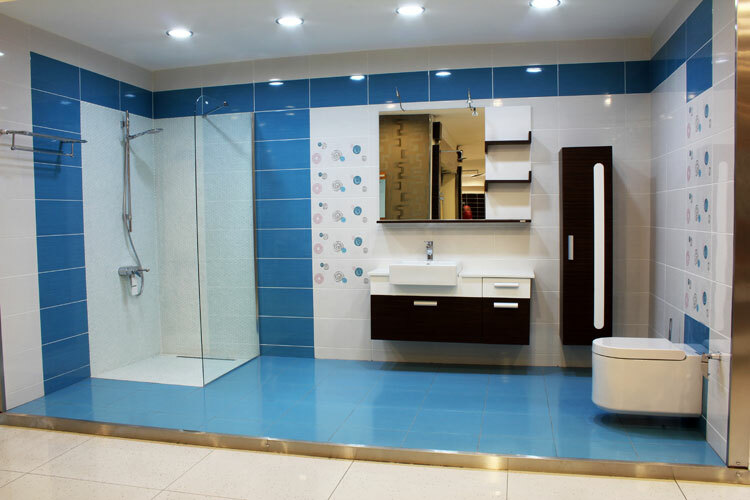 Take a look at this fabulous contemporary bathroom. The design may not be your taste but you must admit it is creative, open for wide use, and the use of these large panel tiles with a few decorative provide context and a theme for the ongoing future of this mixed tile installation. Perhaps you wouldn’t have thought of mixing the types of stone here. But that is what Keith Clay Floors is saying. Be creative when you design. Educate yourself on what is out there for use in the ceramic tile industry. There hasn’t ever been a more creative bent in the tile industry in ages. Much like that beauty shot above, Keith Clay Floors can amaze you with our tile and grout cleaning. Keeping a high end bathroom like this as the beautiful investment you meant it to be is critical and with over 30 years experience in the tile and grout industry it’s our job to WOW you with pleasing results. Keith Clay Floors is dedicated, experienced, and are mixed stone and hard surface professionals. We don’t push dirt around! We extract it from the surface! Having the right equipment to clean hard surfaces to provide sufficient heat and pressure to remove ground-in dirt out of even the roughest, most uneven surfaces is just one of the many professional services we offer to our dedicated clients. Producting both high heat (up to 230 degrees) and contained high pressure (up to 3000psi) simultaneously is one of the options you may select. Remember too that for our clients who have allergies or who just love applying professional techniques to keep their tile and grout sanitized, Keith Clay Floors is the one you need to call. Extracts Dirt – plus grime, oil and bacteria – not just spreading it around. Cleaning the Entire Surface – tile, grout and baseboards. Textured tile, marble, travertine, limestone, slate, brick, concrete. Tile & Grout Cleaning Sanitizes – up to 230 degrees water kills germs and bacteria. Using A Non Abrasive – will not scratch or damage polished, stained, painted or natural stone surfaces. Extends Life of your Tile And Protects – removes grout destroying acidity (winter salts, soils, grease) and with application of sealer, protects from them. Saves You Money – restores your tiles to like-new appearance, for fraction of the replacement cost. Right Now, Keith Clay Floors is offering you a discount to take 10% Off your tile and grout cleaning with a $500 minimum service order. Please give us a call or go back to the home page on this site and complete the form to schedule service. We invite you to see for yourself what ongoing maintenance and cleaning can do for you. Keith Clay has been in business for 30 years serving Dallas, Frisco, Plano, Richardson and all Dallas Metroplex suburbs like McKinney and Allen. We know all about walls and floors and can answer any questions you may have. If you want the best job from a company of professionals, call us today. 972-463-6604.